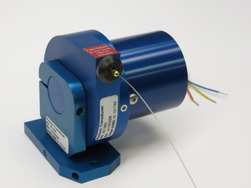 String Pots (also known as cable actuated position transducers, draw wire sensors, string potentiometers, and yoyo pots) convert mechanical motion into an electrical signal that may be metered, recorded, or transmitted. 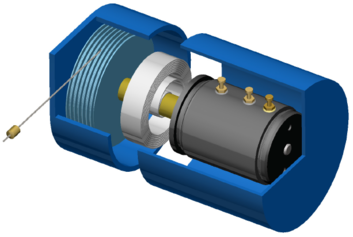 Firstmark Controls string position transducers consist of a stainless steel displacement cable wound on a threaded drum that is directly coupled to a precision, long-life sensor. 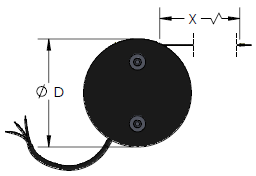 Operationally, the transducer is mounted in a fixed position and the extension cable is attached to a moving object. As movement occurs, the displacement cable extracts then later retracts under the power of an internal, engineered spring which also maintains tension on the displacement cable throughout its stroke. 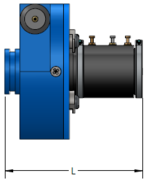 The rotation of the sensor produces an electrical output proportional to the displacement cable giving indication of positional translation. 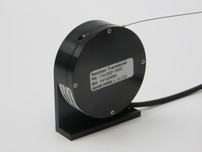 Firstmark specializes in custom transducer design and realization. Contact us or review our Engineered Solutions capabilities for more information. The 16x series is the premier string pot, suitable for an unlimited range of applications and proven in countless industries and 40+ countries. Multiple ranges, spring tensions, and mounting options make for a highly adaptable product that can be configured to meet the needs of the most demanding applications. This unit features an all-aluminum construction and a one of a kind, grooved drum for increased repeatability. Tested to DO-160 standards, the 16x is the only off the shelf string pot that is ready to meet aerospace requirements. Please see our data sheet for environmental and product performance details. Designed for high accuracy and extreme ruggedness, the 15x series string pots have an extensive legacy in a variety of demanding industries making this unit perfect for automotive testing, medical and aerospace applications. Featuring an all-aluminum construction, the 15x series has the world’s smallest envelope and provides a maximum stroke length of 1.5 inches. 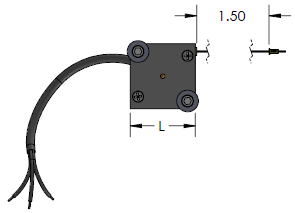 Configurable to both right and left hand pull orientations, the 150 series transducer can be connected directly to your application or mounted to a base for easy implementation. Two spring options accommodate accelerations up to 49g. Firstmark’s 17x series string pots offer a series of ranges up to 0-6.5 inches. These subminiature units feature single turn potentiometers allowing them to maintain their narrow profile. Constructed with Firstmark Control’s signature all-aluminum components and rated to DO-160 environmental standards, these units are perfect for any number of applications and have been commonly used for UAV, manufacturing and crash testing applications. Integral mounting provisions come standard or a versatile base can be added to simplify your implementation.